It's the same for any hippie, bum, or hillbilly out on the street. Just remember the 153 most acclaimed album of all time, and never carry more than you can eat. A 1969 country-rock classic is this week's Counterbalance. Mendelsohn: Gram Parsons. Back on the Great List. This time in the fold of the Flying Burrito Brothers' The Gilded Palace of Sin. Fresh out leading the Byrds away from psychedelica into country rock, Parsons and fellow ex-Byrd, Chris Hillman, teamed up to mine another record out of the same vein. On The Gilded Palace we get to see the beginnings of Parson's Cosmic American Music, especially in the soul covers of "Do Right Woman" and "Dark End of the Street", but that doesn't mean the rest of the record isn't as good. And it is pretty good, Klinger, if country rock is your thing. Hillman and Parsons make a decent writing team (no Lennon/McCartney or Richards/Jagger by any means, but still not bad), and it shows throughout the record, whether it's countryfied honky tonk, pop noodling, or crooning balladry. I have one nagging question though, and I'm sure you already know what I'm going to ask. Is this record where it is on the Great List because of its own merit or more so because Parsons was involved and his posthumous mythology helped provide this commercial flop of a record a little more attention? Klinger: I'm not sure what its commercial achievements have to do with anything, since by now you'd have to recognize that a huge percentage of the records we've covered so far failed to trouble the charts. It's clear though that, at some point between the International Submarine Band and Grievous Angel, Parsons was revealed to be a transitional figure in rock. We touched on this the last time we talked about Parsons, but even if all he did was shepherd the Byrds and the Rolling Stones in the realm of country music, he would have earned a special place in pop history. By 1968, the orchestrated, fiddly baroque style of psychedelic music was getting to be on the outs, and while there were a number of factors involved in that shift, Parsons was able to lend an air of authenticity to the proceedings. Of course, the fact that he was also a gifted songwriter with a keen sense of harmony and melody sealed the deal on his position. Mendelsohn: You make a good point. The Gilded Palace of Sin isn't strictly a country rock record. But when Parsons chose to mix the country with whatever else, he did it so well that it drew the ire of the Nashville establishment who felt that Parson's music was a stain on the wholesomeness of pure country music. A sort of hippie invasion, if you will. Looking back, it's funny to think about. Not only Nashville's revulsion at Parson as an unsavory character—because there were no unsavory characters in country music—but also because country rock and country pop now dominate a large section of the consumer music market. That sort of genre blending, the country aesthetic mixed with dance beats or rock riffs, is a flower off the tree of Parson's Cosmic American Music. Although I'm not so sure he would be happy with the dumb-downed legacy that is the current state of country music. American it is. Cosmic it is not. The only reason I bring up the commercial success of the album is because the critical complex was still fairly nascent at the time and commercial success was usually tied to critical success. This record didn't get much attention until Grievous Angel really brought Parsons' music into the public spotlight. That's why I'm a little stuck on the question of whether or not The Gilded Palace of Sin would be on this list without the success of Grievous Angel. Is this record's placement just a byproduct of being pulled in by the gravitational force of Parsons' mythology? Klinger: Well, it is true that Parsons' mystique has continued to grow, and certainly part of that is down to the fact that he never made any bad music during his lifetime (he didn't have to suffer through the bemulleted 1980s, which were less than kind to artists of his generation). And whatever the critics were or weren't saying about the Flying Burrito Brothers at the time can be forgiven; it's not like the Velvet Underground were on the cover of Rolling Stone in 1968, either. But at the same time, it's hard to argue with the strength of The Gilded Palace of Sin, especially when it comes to the musicianship on display here. Not to sound too much like a hippie, but there was a certain sense that, between the Flying Burrito Brothers on the West Coast and the Band on the East Coast, the Boomer generation might have been looking for a way to incorporate older sensibilities into a modern mindset, and that from that there could somehow be an American music—and subsequently an American culture—that could include everyone. So Hillman's bluegrass background makes a song like "Me and My Uncle" nearly perfect (although that does would have to have made its draft-dodging lyrics an even bigger mind-messer to older folks). And "Sneaky" Pete Klienow was a true Renaissance Man, having split his time between brilliant pedal steel (his work on "Sin City" is a particular highlight) and special effects wizardry for The Empire Strikes Back, which means two of my inner nerds are right now fighting amongst themselves. Mendelsohn: There's no need for the nerd-on-nerd violence. Get your inner voices under control, sit them down in front of the TV, put on The Empire Strikes Back, hit mute and then play the The Gilded Palace of Sin. This type of thing works for The Wizard of Oz and Pink Floyd's Dark Side of the Moon, it has to work here, right? What better sound track to watch Luke Sykwalker and his rebel friends struggle against Dark Vader and the evil Empire than the wonderful harmony of Parsons and Hillman? There's a long and somewhat convoluted analogy working itself out up there but I don't really have the patience to see it through to the end, nor do think it will be all that enlightening. That said, I found myself really enjoying the subversive nature of this record. Not only, as you mentioned, in the lyrics of "Me and My Uncle", but the way Parsons, Hillman, and the rest were able to subvert country music, and I suppose rock 'n' rock as well, to create the space necessary to make the music they felt needed to be made. I think I finally understand Cosmic American Music. Klinger: You know, this seeming tangent we’ve embarked upon may prove to be more apt than we realize when you factor in Saturation 70. Following the release of The Gilded Palace of Sin in early 1969, Parsons embarked on a project that may have shed even more light on his vision—and possibly served as an object lesson in all of the craziness that was going on around him at the time. Parsons was in the throes of some massive pharmaceutical problems. 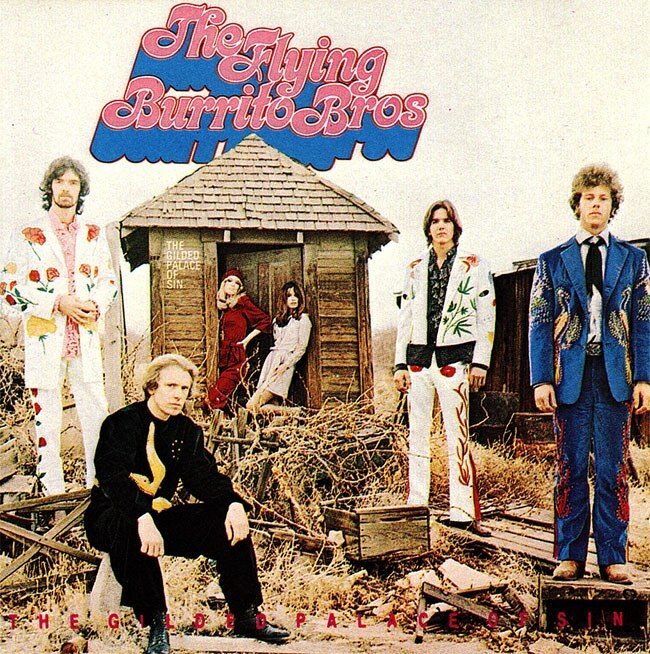 The Flying Burrito Brothers were disintegrating in the face of disappointing sales (bassist Chris Etheridge would leave the group around this time, and tensions were high between Parsons and the far more professional Hillman). And Parsons began to align himself with unsavory sorts (most notably class act Phil Kaufman, who served as a liaison between the LA rock scene and the Manson Family). So this pop-surrealist science fiction film might have been something of a respite for him. Not much survives from Saturation 70, which ran out of funding before it could be completed, but apparently it involved UFOs, Michelle Phillips of the Mamas and the Papas, the Burritos (appearing in white jumpsuits as the Kosmic Kiddies), supermarkets, and a parade of Ford Edsels. Parsons collaborated on the script with filmmaker Tony Foutz, and it may have contributed even further to our understanding of Cosmic America. Or it may have been a complete bafflement. Either way, it's a reminder of the sense of freedom that had yet to be completely beaten down in 1969.